If you don’t want to use a chemical wormer on your hens or would like the reassurance that a herbal product is working then the Westgate Labs Worm Count Kit could be the answer! Keeping chickens on the same ground for a number of years can cause a build up of worm eggs. There are three types of worm that are commonly encountered in our flocks: Roundworms (Ascaridia galli), Hairworms (Capillaria) and Caecal worms (Hetarakis gallinarum). These all affect the intestines but the first two, roundworms and hairworms cause the most damage to the hens’ gut causing health problems, even mortality. Caecal worms often don’t cause damage but they usually carry another parasite called Histomonas, the cause of Blackhead which can also cause mortality. Many backyard chicken keepers will routinely worm their chickens every 6 months or more if they suspect a worm problem, but this approach isn’t recommended anymore because of the build up of drug resistant worms. In a nutshell, some worms will survive the worming treatment and go on to produce further ‘drug resistant worms’. I wrote about this last month in Should You Worm Chickens? If you take a hen to your vet and they suspect the problem might be caused by worms, they may send faecal samples away to a lab for testing. This is called a worm egg count and I’ve heard of this costing £35 to £50 but now, there is a Worm Count Kit available from Westgate Laboratories (who are based in Northumberland) for around £15. They can be purchased online and contain everything you need to collect and send off a faecal sample from your chickens for testing. If your flock doesn’t carry worms, then of course you don’t have to worm them using a chemical wormer such as Flubenvet. Worm eggs can be identified in the lab by examining faecal samples under a microscope. This is called a ‘worm count’ because the number of eggs in a sample are counted in a grid and the results returned, counted as ‘eggs per gram’ (e.p.g) in the sample. Worm counts are especially useful if you’re using a herbal product such as Verm-X and want to have the reassurance that it’s working for your hens. 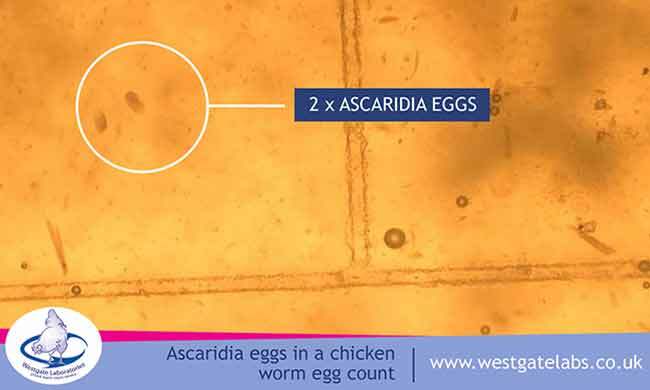 The worm count will show Coccidian Oocysts (more on Coccidiosis here), Roundworm (Ascaridia) eggs, Hairworm (Capillaria) eggs and any other eggs seen in the sample. Two Roundworm (Ascaridia galli) eggs under a microscope during a worm count. Tapeworm eggs will not be seen in a worm count because of the way they are expelled. A tell-tale sign of tapeworm will be shedding of tapeworm segments in droppings (you can see a picture on our tapeworm page) but if you see anything unusual with a dropping then it can be included in the sample when you send it off to the lab to be tested. I used the worm count kit to test my flock of free range hens for the presence of worms. There are very clear instructions with the kit and it didn’t take me very long to collect the droppings samples, mix them in the bag provided and then add them to the sample box for sending off. Collecting fresh droppings and putting them into the mixing bag. The worm count samples need to be mixed. The container is filled from the mixed samples. What happens to the sample you send off? I guess you’re wondering what happens to the sample you send to Westgate Labs? Well, I was wondering too, so I asked them to send me some photos of my sample travelling through the different processes. Worm sample kits set out ready for testing. Racked Test Tubes ready for examination. Once the sample arrives at the lab, it is processed on the same day and the results are sent out immediately by email or telephone call so you know whether or not you need to worm your chickens. I was pleased that there were no eggs found in my samples, so I didn’t have to use Flubenvet on my hens. The Worm Egg Count Kit from Westgate Labs allows you to check your hens for the presence of common worms in your hens. Individual samples can be sent off, or a mixed sample to test the whole flock. This saves you having to use the chemical wormer Flubenvet, but can also give you the confidence to keep on using herbal products such as Verm-X. I found the whole process very easy and the results usually come back the next day after posting, so a fast result is obtained. I can highly recommend you take this approach due to concerns about drug resistance, which is especially true when there are very few licensed products on the market to use. 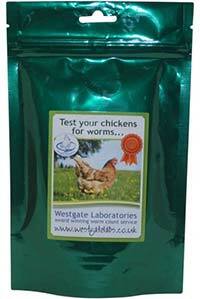 Test your chickens for worms using the postal faecal egg count kit from Westgate Labs. Monitoring the results of this test will allow you to avoid frequent and repeated use of a wormer which will help to prevent the build up of drug resistance in your chickens. . Worm Testing Kits are available to buy online here.